The orbicularis oris is a complex muscle consisting of fibers that completely encircle the mouth. Its function is apparent when pursing the lips, as occurs during whistling. Some of its fibers originate near the midline from the maxilla superiorly and the mandible inferiorly, whereas other fibers are derived from both the buccinator, in the cheek, and the numerous other muscles acting on the lips. It inserts into the skin and mucous membrane of the lips, and into itself. Contraction of the orbicularis oris narrows the mouth and closes the lips. Insertion: Into the lips as it surrounds the mouth. Attachements: The lateral ends of all four portions of the orbicularis oris simply attach to the muscular nodes at the angles of the mouth. The nodes function as movable points of attachment for the orbicularis oris; other facial muscles insert into the nodes and move them into various positions, such as upward or downward, medially or laterally, anteriorly or posteriorly, and then stabilize them. The orbicularis oris surrounds the mouth, lying in the upper and lower lips. It is continuous with the muscle of the other side (in both the upper and lower lips). The orbicularis oris is well developed in the horse and ox, which use the lips for grazing, and less developed (less mobile) in dogs and cats. The mouth, primitively prehensile, has evolved into a most refined organ of expression and speech. The orbicularis oris, which forms the mouth proper, is the most complex of the facial muscles. It is a thick muscular mass that covers an area larger than the red lip portion of the mouth, extending upward to the base of the nose and downward to the beginning of the chin (down to or just below the mentolabial sulcus). The orbicular oris is not a sphincter muscle, but is divided into an upper lip portion and a lower lip portion. These are further subdivided into outer (peripheral) and red lip (marginal) portions. The red lip portions consist of fibers located within the red portion of the lips. The outer portions are wider bands of fibers that are situated beyond the red part of the lips. In other words, there are four parts to the orbicularis oris: the red lip portion of the upper lip, the red lip portion of the lower lip, the outer portion of the upper lip, and the outer portion of the lower lip. Each part passes continuously from the muscular node on the left side of the face to the node on the right. These four parts can function either independently or together. Which nerve innervates the orbicularis oris muscle? 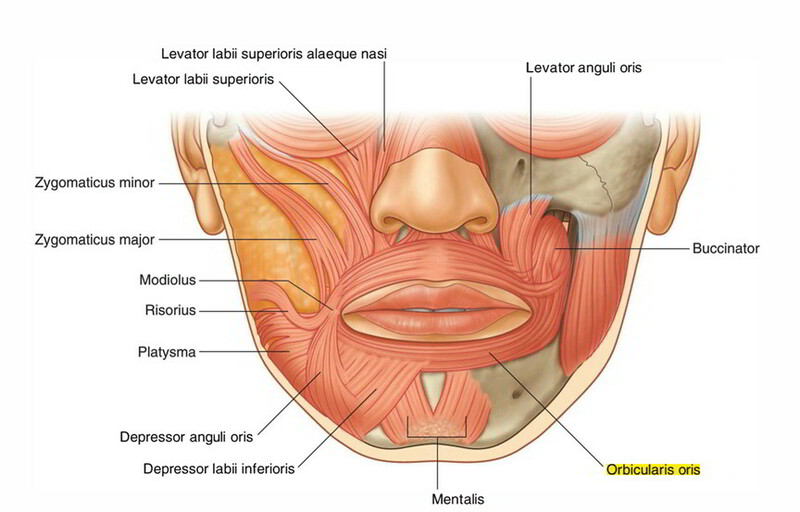 Where does the orbicularis oris primarily originate from? How many portions of Orbicularis oris generally exist? The orbicularis oculi is well-developed in which of the following animals?